What is the difference between Post & Beam and Timber Frame? There is often confusion between “Post and Beam” and “Timber Frame”. Both types of construction involve exposing the beauty of wood as the main structural framework or “skeleton” in a building. In general traditional timber frame (throughout its history) has used wooden connections to support the building structure, with the use of carefully cut “mortise and tenon joinery”, and wood braces. Connections are precision fit in wood, using wood pegs. These connections can be cut by hand or by machinery. Post and beam usually utilizes simpler joinery, and connections can be made with hardware — such as metal connectors. Connections may be exposed or hidden. Also the post and beam frame itself is usually quite simple as the name implies – a vertical post with a beam on top – and the applications are often on simple roof systems or single pitched roofs. What design resources can Tamlin offer to help your project? In general, when custom building the owner-builder usually wants to weigh alternatives at each step of the design process. This can involve many combination’s of comparing quality, durability, appearance, safety, function, installation, maintenance, and most importantly COST. As the designer/builder, we can think globally about the house design, and offer solutions which the home owner can debate and choose the lifestyle change, material quality change or the budget change. We have the resources to offer our in-house designers, project managers, sub-trades, or other professional architects and interior designers to offer building solutions so that “value” engineering can occur. How do we make planning, design and efficient process? Since Tamlin is usually involved from the initial stage of planning and house design, we are in the best position to recommend design features, and important construction details that can reduce on-site construction time and costs. Our hybrid timber frame roof and wall systems for example can be designed in several different ways, and we help you choose the optimal system for your home. Some designs are more energy efficient while other designs may solve engineering issues which address your location and structural/strength requirements. Do we have standard plans? Yes, many which we have modified into hybrid timber frame plans for reference. We have a data base of hundreds of other plans that we have done over the years. What is the advantage of our custom design process? First we can offer a ballpark or rough overall costing depending on the complexity of the project. Second we can provide quick 3D color renderings to show you preliminary design ideas before too much time is spent on expensive architectural work. This speeds up the process and saves costs. Third, we can provide a rough budget with your preliminary plans so you can adjust the plan sooner than later. What types of homes can we design? Our design specialty is custom designing residential timber style homes and cottages but our flexible approach and experience has seen the completion of a wide range of buildings, including remote island projects, custom post and beam resort area or remote island homes and cottages, commercial motels, hotels, pensions, bed & breakfasts, and recreational buildings. What are the ways to custom design? 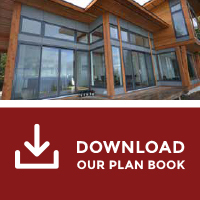 You can modify an existing plan from Tamlin Design Portfolio or provide your own design and we will turn it into a hybrid timber frame home. Or you can start from scratch and we will turn your ideas into a custom home. We can also introduce our local registered architect if you need. Do we provide construction and permit drawings? Yes. We also have a network of builders in other provinces, so we can get your “local” drawings “stamped” by a qualified engineer. What design TIPS do we have?